Willie is a young woman who’s just had her wedding plans yanked out from under her. Catching your fiancee in bed with another woman will do that. So she’s now spending the month that would have been her honeymoon in Italy, pet-and-apartment sitting on Tompkins Square in New York. As Willie tries to reboot her life, she watches too many woman-in-jeopardy movies on TV, and pays entirely too much attention to the pontificating parrot in her care. But gradually she comes to a startling conclusion: the attractive man who lives next door is a vampire. 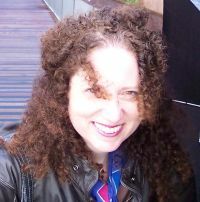 “Bram Stoker’s Summer Sublet” is the second in Candy Korman’s series that she calls “Candy’s Monsters.” She blogs about her writing here. …once again I’ve written something that falls between genres. It’s not a paranormal romance or horror, but what is it? There are comedic elements, but it’s not straight out comedy. It has aspects of psychological suspense, but I wouldn’t characterize it as a suspense novella. There’s definitely a shaggy dog component — two, if you count the shaggy dog in the story. The protagonist’s internal monologue skirts around some profound philosophical questions, but believe me — this is NOT a deep contemplation on the nature of life. Nothing that includes Jerry Springer, The New York Daily News and bad made-for-TV movies is completely serious. This is not to say there aren’t some pretty serious moments in the story and some ideas worth talking about. Confirmation once again, if I may observe, that indie authors are – as a rule – far more willing, and able, to cross traditional genre boundaries than traditionally-published authors are (or can be). What a great interview! This is literally my first audio interview or my first try of a podcast? I’m not even sure of what the correct terminology is but I think I’m hooked! Thanks very much and good luck with Bram Stoker’s Summer Sublet Candy! I’m a fan already and I think you’re on a winner here. Thanks for listening to my first interview with The Bookcast. I hope that talking about Bram Stoker’s Summer Sublet helps to start a buzz going. Concerning the inexpensive camera for a younger ch#i8&ld230;. lets not forget the “hot deals” that will soon be out (Black Friday). With my experience, Best Buy always have cameras included in their door buster specials that would be a very reasonable solution, assuming you will be frequenting the store the day after Thanksgiving. So glad you think my MONSTERS are awesome. Hopefully fans will love the books. I enjoyed listening to her and her reasons for doing them. One smart Cookie !!!!!!!! I’m a cookie monster! Glad you enjoyed the interview. Help get the word out so more people will ready my Candy’s Monsters ebooks on their Kindles or, with the Kindle Reader App, on their computers, Tablets and phones. I just finished Candy’s new book and I loved it. So happy to get this comment AFTER you’re read the book! It means even more this way.